In today’s world, many people spend long amounts of time in front of their computers. The need to refocus your vision over and over as you use an electronic device is a part of using computers and tablets. However, this can put a lot of strain on your eyes, possibly leading to what is know as computer vision syndrome. This condition is not necessarily defined by a single problem, but rather a variety of symptoms that result from the extended viewing of electronic screens. Computer vision syndrome can result in a variety of symptoms, including eye irritation, dry and red eyes, double vision, blurred vision, headaches, and neck or back pain. Untreated computer vision syndrome can potentially lead to ongoing pains and aches in various parts of the body, in addition to vision problems. Computer vision syndrome can be the result of extended computer usage while the user is experiencing another eye vision-related problem. These issues could include not having glasses when the user needs them, or if their glasses are not the correct prescription for computer use. The strain resulting from using the computer while having an untreated vision issue can lead to the symptoms of computer vision syndrome. As people get into their 40s, presbyopia can set in, a condition where the ability to focus on things that are near and far away will begin to go away. 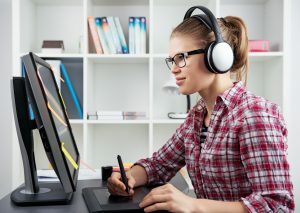 This can make working on the computer more difficult for your eyes and can result in in the symptoms of computer vision syndrome. Reading off a computer screen comes with certain visual properties that paper does not. Such as, glare, contrast, and flickering. These all contribute to the strain on your eyes as you read from the screen. If there is a light source causing glare on your screen, such as overhead lighting or sunlight through a window, removing that glare is a good idea. Window shades, desk lamps and dimmer switches for overhead lights can all help reduce glare from these light sources. Using the 20/20/20 rule can also be helpful, where you look away from the computer screen every twenty minutes, instead looking at something twenty feet away from you for twenty seconds. Keeping your monitor between 20 to 28 inches from your face and positioned a little below your eye level, will reduce strain on your eyes and neck. Having any paper materials on a stand next to your computer monitor keeps the movement needed to look between the computer screen and papers to a minimum. Adjusting screen settings like brightness, contrast, and font sizes also can help reduce eye strain. Should your computer vision syndrome problems continue even after making adjustments, consider contacting an optometrist for a consultation and appointment, as new prescription glasses made be needed to alleviate symptoms. Eye Care Associates are dedicated to helping people suffering from computer vision syndrome who are located in the Houston, TX area. Contact them online or at (713)621-9001!